On the eastern shore of the Vatnsnes peninsula in the northwest of Iceland there lies an amazing rock formation dubbed as ‘Hvítserkur’ (literally meaning ‘white shirt’ in Icelandic). The 15 metre (or approximately 50 feet) tall sea stack resembles a dragon (or a troll, depending on the angle of perspective) drinking from the North Atlantic Ocean. Hvítserkur is sometimes home to such seabirds as gulls or fulmars. So it is that the etymology of its name (i.e. ‘white shirt’ in English) can trace its origins from the birds’ guano sedimented on it. Once a plug of a local volcano, with the influence of the North Atlantic Ocean’s waters it turned, over the passing of time, into this extraordinarily naturally-shaped sculpture. 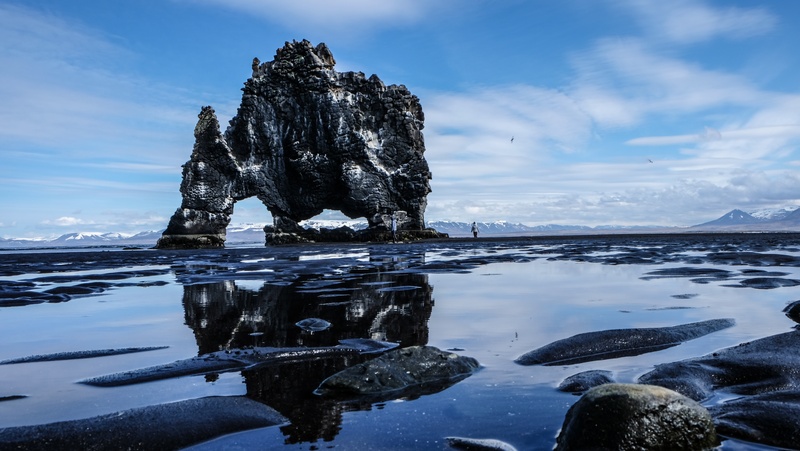 According to an Icelandic legend, this humongous basalt is said to have actually been a troll once upon a time. Because the troll forgot to hide away at sunrise, he was petrified by sunlight and turned into this immense monolith. This huge rock has two holes at the base and a rather unusual shape at height which apparently gives one the impression of a ‘rocky dragon’. In order to solidify its foundation, the sea stack was added concrete as a means of protection against the tide. In 1990, an Icelandic postage stamp commemorated this natural wonder.